If it's for random squat party or traveling 1000's of miles to a festival in a beautiful remote paradise, there's no place Eric loves to spend his time more then on a dancefloor full of smiling happy faces and intense energy build ups. 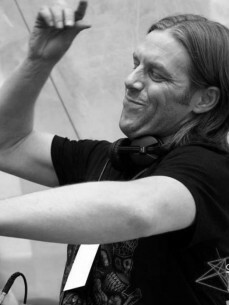 As early as '94 he has been involved in the Dutch psytrance scene. Whether he was organizing parties, dj'ing or just lurking around and having fun, this is where Liftshift found his bliss for developing his artistic needs. Growing up in a rich musical environment, he started playing guitar at the age of 10. In his adolescence Eric played in various bands varying from Metal to Jazz performance. This is where his love for performing music live on stage started to take shape. When he discovered Goa trance in '94 Eric took a leap from playing in bands to spinning records. Since the familiarity with psychedelic trance was on a low level still, Eric and his mates started organizing small underground events as early as '96, which didn't just attract many people from all colors and creeds but raised a huge enthusiasm for the music that had never been heard by many. Since Eric (Liftshift) started producing his own music in 2003 putting the trance vibe into his own unique sound, he took off on a journey that would soon take him to many dance-floors worldwide to play his fat and unique progressive sound. Since that time he has been releasing on labels like Echoes, Neurobiotic, Flow, Spin Twist and Plusquam frequently placing himself high in the top 10 of the Beatport charts if not on a No.1 position. These successes have taken him from Universo Paralello festival in Brazil to Full Moon festival in Germany and the classical surrounding of ancient Italy for the infamous Sonica Gatherings amongst many others. In 2010 Eric started working together with “Neurobiotic records” and released the highly acclaimed “Full Cycle” Ep as well as a remix on the “Zen mechanics Remodified” remix album . Summer of 2011 Lifty teamed up with Wouter Thomassen a.k.a. Zen Mechanics and started a label together by the name of “Sourcecode”. They will be releasing their own music on “Sourcecode” amongst the fattest quality sounding tracks from their friends and peers. Releases will start coming your way as soon as June 2012. Eric is currently working in the studio on his debut album, many remixes and collaborations with artists to the likes of Zen Mechanics, E’clip, Sonic Species, Cimi, Journey and Protoactive.